I just drove two electric cars on the same route that included demanding freeway acceleration, cruising along a beautiful ocean highway, serious hill climbing, and maneuvering through street traffic. Let’s compare the Mitsubishi i with a starting price of $29,125 with the Nissan LEAF with a starting price over $6,000 higher. 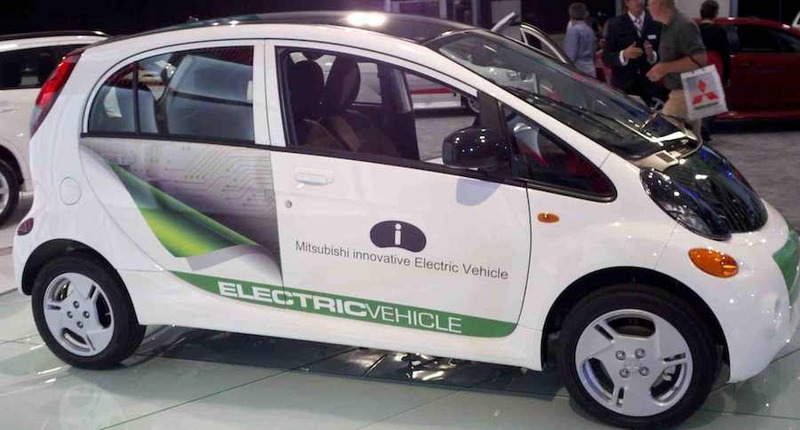 Mitsubishi will finish 2011 with about 5,000 electric cars on the road globally. Mitsubishi has taken orders for 400 of the Mitsubishi i in the USA and will start dealer deliveries in about 3 months. 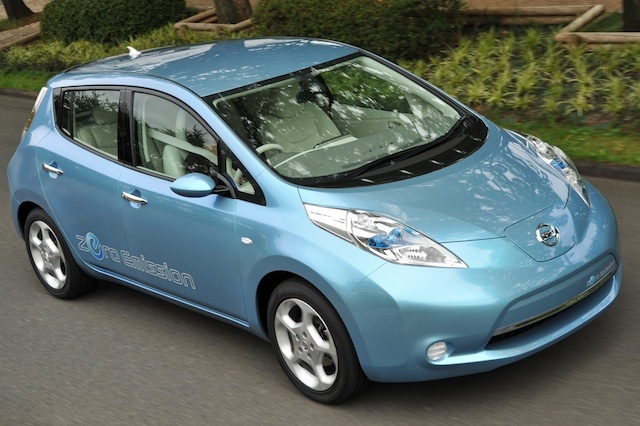 Nissan will finish 2012 with about 50,000 electric cars on the road globally and 20,000 delivered in the USA. The Mitsubishi i is a 5-door, 4-seat, microcompact with more room inside than a MiniCooper and friendly outside looks similar to a VW bug. The Nissan LEAF is a 5-door 5-seat, compact hatchback with stylish yet conventional looks. I started each test drive at a Best Buys in Northern California. Mitsubishi is first touring the West Coast and later other parts of the country letting people take their EV out for a spin. Some showed up solo, others brought the family including kids and car seats. Best Buys will be putting some Mitsubishi i cars into their Geek Squad fleet. Best Buys also sells the Eaton Level 2 charger and can arrange the charger installation in your garage. Being a pure battery-electric the Mitsubishi i cruised the first mile in near silence, demanding little work from the electric motor. Then I entered a freeway onramp where I was forced to accelerate into merging freeway traffic up a 6-percent grade. I shifted from ECO to Drive mode for better acceleration. On a flat the Mitsubishi can go from zero to 60 in 12 seconds. Up these steep freeway grade the Mitsubishi merged into traffic, slowly accelerated to 70 mph passing a couple of cars and trucks that were struggling with the hill which I purposely selected for this test drive. When I reached the peak, I was rewarded with a magnificent view of the Pacific Ocean stretching to the horizon. As I took a steep downhill decent, I shifted into “B” which aggressively applied motor resistance for regenerative braking. When I leveled out on Coast Highway, I shifted back into ECO mode that extends the electric range about 10 percent by smoothing acceleration. After 3 miles I ascended another steep hill. ECO mode handled the ascent just fine. The Mitsubishi i handled curves well. It had a bit of a sports car feel due to its low center of gravity and rear-wheel drive handling with the electric motor over the rear axle finished the drive in stop-go traffic with the car handling lane shifts with ease. On the identical route, I drove my own Nissan LEAF that has been problem free in all driving situations for six months, rain or shine, day or night. The LEAF merged on to the 6-percent freeway grade with more ease than the Mitsubishi, as I shifted from ECO to “D” (drive mode). The LEAF reach 80 mph faster than the Mitsubishi I reached 65 mph. The LEAF has an 80kW electric motor; Mitsubishi 49kW. As I descended towards the Pacific Ocean, I shifted into ECO mode. The LEAF does not have a “B” mode for extra regen braking, but like other electric cars it does put energy into the lithium battery pack during downhill, when braking, and even when the computer determines that extra energy can be captured. Enjoying the drive along Coast Highway, I fishermen casting lines, surfers catching waves, and golfers hiking into the rough. Like the Mitsubishi i the LEAF climbed hills fine in ECO mode, handling windy curves with ease, and cruised the surface streets in silence. The LEAF seemed a bit more quiet than the already quiet Mitsubishi i. The Mitsubishi i appeared to achieve 4.3 miles/kW; the 600-pound heavier LEAF only achieved 3.9 miles/kW. The Mitsubishi did not offer a precise reading, just a display showing battery use. The LEAF offered a precise read-out. I did push the LEAF to 80 mph, so the comparison is not perfect, but indicates that the Mitsubishi uses a bit less electricity. Since I have never paid over $40 per month to keep my LEAF charged; the difference is not much. The lighter Mitsubishi i has an EPA adjusted range of 62 miles with its 16kW lithium battery pack; the Nissan LEAF has an EPA adjusted range of 73 miles with its 24kW lithium battery pack. Stay in ECO mode and stay below 50 mph and you are likely to have a 100-mile range in the Mitsubishi i and 120 in the LEAF. In pure electric cars, range concerns are real unless you can afford a Tesla Roadster or the new Tesla Model S with a 300-mile range option. To extend range, I always drive my LEAF in ECO mode and rarely exceed 65 mph. I go for smooth driving and use cruise control. On 10 percent of trips, I use Charge Point or Google Maps to find public charging stations, and sometimes spend an hour or two on the computer in the café as I pick-up 10 to 30 extra miles of range. The 2012 LEAF has a Level 2 Charge of 6.6 kW/hour, double the speed of the Mitsubishi 3.3 kW/hour. For some people, that speed will matter. The 2012 Nissan LEAF comes standard with both DC Fast Charge (CHAdeMO) and Level 2 Charge ports. The DC Fast Charge is an optional extra on the Mitsubishi and narrows the price difference between the two cars to less than $3,000. With either car, a DC Fast Charge can provide 80 percent range in about 20 minutes. Both cars include a cable so that a 110 volt outlet on a dedicated circuit can be used to trickle charge the car, which turns out to be adequate for most people, as we discovered when we had to wait a few weeks for the installation of our Level 2 garage charger. Since the average American drives 40 miles per day, the Mitsubishi i will meet the needs of most people. Some will prefer to pay the extra $6,000 for the extra range of the LEAF. Because my wife and I have two cars, range has been no problem in our six months of driving. For longer trips, we use the hybrid and save the LEAF for most days. We are also helped with over 100 public chargers installed in the Bay Area where we live and drive. If you need one car to meet all your range demands, an electric car may still be the answer if you use car rental, car sharing, and/or transit and rail. Others will be happier with a plug-in hybrid, which stays in electric mode for typical trips and acts like a hybrid for long trips. To extend range, just visit the gas station. The have also been impressed with my test drives of plug-in hybrids like the Chevrolet Volt and Toyota Prius Plug-in. The 2012 offerings from Ford and Honda are also likely to be impressive. The Mitsubishi i has 85 cubic feet of interior space, 13 cubic feet of trunk space, which expands to 50 with the 50/50, split back seats lowered. The Nissan LEAF has 112/8 cubic feet of interior space, 14.5 cubic feet of trunk space, which expands to much more than the Mitsubishi I when 60/40 split back seats are lowered without needing to remove the headrests. In my LEAF, my wife can load the back for projects at the schools where she is a speech therapist. I can easily fit my bicycle in the LEAF by removing the front wheel of the bike. In the Mitsubishi i, both bicycle wheels would need to be removed and rear seat headrests would need to be removed. 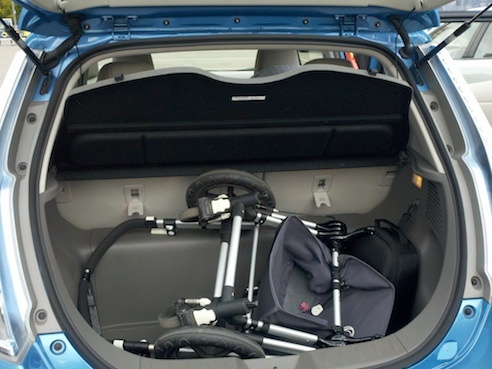 If you need to use a rear child seat or two, you will definitely prefer the Nissan LEAF. You will be even happier with the upcoming Ford C-MAX Energi plug-in hybrid. I have been in a Nissan LEAF sitting behind a 6 foot, 4-inch driver, and then had him sit behind me. The car is a roomy compact that can seat 5. The Mitsubishi would be a tight fit for four big adults. To its credit, the USA version is bigger than the iMiEV driven in Japan and Europe. The Mitsubishi has more passenger space than some city cars I have driven like the Smart and the MiniCooper. I felt safe in both cars, even when merging into freeway traffic. Some expressway drivers will feel saver in the larger Nissan LEAF, but this Mitsubishi i received a 4-star rating in stringent crash testing performed by Euro NCAP, a multinational vehicle safety-testing consortium in Europe. Nissan Leaf is the first electric car to earn five stars from the National Highway Transportation Safety Administration. The 100-percent electric Nissan LEAF earned a 5-star overall vehicle rating for safety as part of the National Highway Traffic Safety Administration’s New Car Assessment Program (NCAP). The Nissan LEAF is the first fully electric vehicle to earn this highest distinction from the program. Starting with 2011 models, NHTSA introduced tougher tests and requirements in order to earn 5-star ratings. When driving in snow or heavy rains, some will fell safer in the LEAF with its extra 750-plus pounds of weight. If you regularly must deal with snow, ice, and wet roads, you might do better with an AWD car than in an electric, but you’ll be making regular visits to the gas station. Both the Mitsubishi i and the Nissan LEAF are wonderful electric cars that are currently being sold faster than they can be made. For some, the choice will be which car they get first. For others, $6,000 will be the deciding factor. After a federal tax credit of $7,500, the entry cost of the Mitsubishi electric car is only $21,625. The savings of no gasoline and little maintenance, save electric car drivers $1,000 to $2,000 per year. For city drivers fighting for parking spaces, the smaller Mitsubishi i will allow them to fit into spaces that others cannot and save big by avoiding paid parking. The Mitsubishi i is a maneuverable city car that’s fun to drive. The Nissan LEAF is America’s most popular electric car. It has enough room inside for 5 people and a fair amount of cargo. It has surprising performance and about 15 percent better electric range than the Mitsubishi i. The 2012 LEAF Level 2 charges at twice the speed of the Mitsubishi i. If you need premium features like DC Fast Charging, back-up camera, and hands-free audio, then the price gap between these two cars is less than $3,000. Select either and you can feel good about helping with our energy security, environment and never being stuck in line for a gas pump. Take a test drive, you’ll enjoy it. Much appreciated. Keep up the good work and I’m sure we’ll be “talking” again soon. John, I enjoyed the comparison very much. One question, however; when you stated that your monthly electricity for the LEAF has never crossed $40, how do you know this? Does the LEAF specifically track the electricity it is using to recharge? I would assume so, but I really am not sure.